Blend of Peppermint, Ginger, & Fennel. This is a great blend to have on hand for an upset stomach of any kind! Blend of Wood Betony, Rosemary & Peppermint. 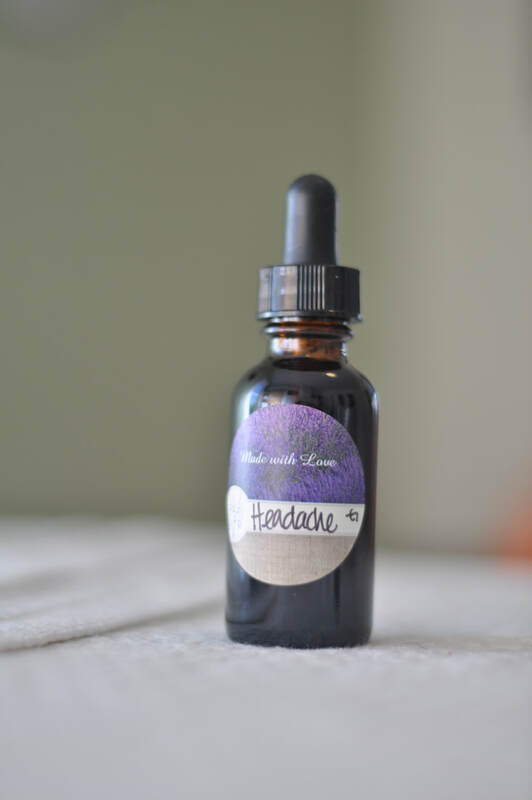 I like to have this on hand, when I don't have the loose herbs to sip in a tea ,to keep headaches (not associated by neck misalignment or pinches) at bay. Blend of Catnip & Chamomile. The is perfect to have on hand for colicky, cranky or teething babies. Those suffering with gas or bloating and for those with trouble sleeping. Blend of my 3 favorite herbs- Kelp, Stinging Nettle, and Alfalfa. Click here to learn why I love this blend! Blend of Echinacea, Elder Flower, Lobelia, Oregon grape root, Red Clover, White pine bark & Cayenne. Very effective as a first response hen you feel a cold coming on. Great for children (can be a bit spicy but can mix in!). Excellent lymph draining properties and for controlling fever. 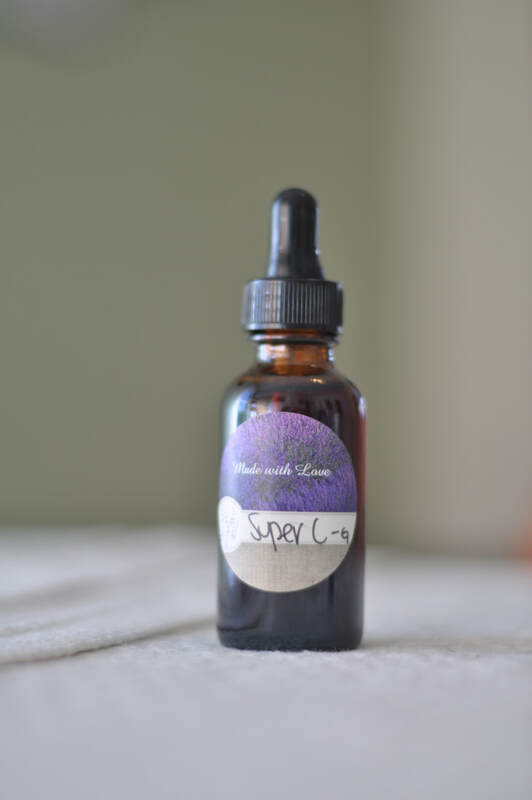 Many have said when they feel something coming on and get right on Super C it doesn't go any further than that! Blend of Marshmellow, Mullein & Juniper. I like and recommend this blend for regular use to support the kidneys if you have Foot Zone therapy, or any cleanses or detoxes. It is a mild diuretic and helps to alleviate many of the symptoms of chronic conditions caused from uric acid build up. This is a favorite blend. Made with Buckthorn, Burdock, Cascara Sagrada, Chaparral, Licorice root, Oregon grape, Peach, Poke root, Prickly ash bark, Sarsaparilla & Stillingia root. Very effective infection fighter and has been used successfully as a cancer fighting formula! Yet safe enough to use even when pregnant or nursing. Very potent blood cleanser and acts as a detoxifier and carries toxins and lingering cancer cells out of the body. To read why I consider Gelatin one of my daily super foods click here! To read why I consider Collagen and Gelatin one of my daily super foods click here! What energy is and how to recognize/see and feel it. Learn about Chakras; their positions and meanings. How to conduct a Reiki session including learning hand positions for basic Reiki treatments, shielding and grounding yourself, and client conduct. Learn to work with energy for the purpose of promoting health; physically, emotionally, mentally, and spiritually. Students will also practice on each other and receive a Reiki treatment during class. Receive the First Degree Attunement in preparation for entering a new and wonderful world of healing! Reiki level 2 cost is $300 - this price includes your manual, 2 days of class, mentoring, energy clearing, certificate and required internship. Exciting information about distance symbols and distance Reiki sessions! Reiki ART cost $350- this price includes your manual, 2 days of class, mentoring, energy clearing, a healing tool of your choice, certificate and required internship. We will learn tips, tricks and guidance on building your business as a Reiki Master/Teacher. Including licensing, legal responsibilities, financial records, marketing and managing your business. Reiki Preparation- A meditation that incorporates Reiki energy into the physical body and facilitates a strong connection with the earth, heals chakras, helps you become more centered in your own power and brings mental clarity and spiritual consciousness into the physical body. Receive Reiki Master Attunement in preparation for entering a life changing world of Healing.